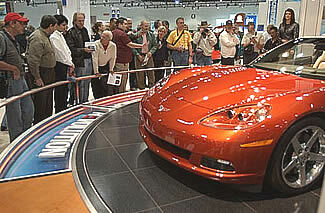 As soon as the L.A. Show opened on Monday the 5th, 100s of Corvette owners and enthusiasts clustered around the C6. Los Angeles, California, Jan 5th---No more rumors. No more spy shots. There it was: a Daytona Sunset Orange '05 Vette, sittin' on a turntable at the Greater Los Angeles Automobile Show for everyone to see. Monday, 1/5/04 went down in Corvette history as the first time Joe Average saw a C6. For the most part, Mr. Average liked what he saw. Oh, hell...that's an understatement. Ole Joe was totally stoked and his wife, Josie, told him to put her BMW up for sale and order one, right now. Though Chevrolet threw a glitzy C6 unveiling party for about 2000 people the night before in Michigan, you had to be invited media, a VIP or selected GM "internals" to get in. Hell, even Britney Spears couldn't get a ticket for Rick Wagoner's performance on-stage with the new Vette, so she flew to Vegas and got married. Virtually all rank-and-file Corvette enthusiasts, Joe and Josie Average included, were locked-out of the gig at the up-scale Detroit Opera House. If you high-speed Internet, you could watch a webcast of the unveiling or, if you had a analog satellite TV receiver (the ones with the big dishes), you could catch Chevrolet's feed to its dealers off the Galaxy satellite. Ansel Boyce, tells KABC-TV his feelings about C6. His 15 seconds of fame came that night on Channel Seven's 5 o'clock broadcast. The "orange car," one of two C6 prototypes in show trim, was flown to L.A. on Sunday afternoon, trucked to the L.A. Convention Center and loaded onto the floor that night. This morning, at 11:00 AM when the L.A. Auto Show opened, hundreds of Vette fans, all suffering acute C6 mania (very serious, but thankfully, they'll recover) flocked to the Chevrolet display to see and hear all about the new car. California Corvetters traveled from all over the southern and central parts of the state­from towns like San Luis Obispo, Fresno, Upland, Yucaipa and San Diego. Los Angeles TV stations were there to catch reactions to the new car. Retired Fire Chief, Ansel Boyce, a C2 and C5 owner from Upland, told The Corvette Action Center, "It's a refinement of the existing C5, moving the Corvette into the future. An outstanding looking automobile maintaining the legend. I want one but I will have to wait until the Z06 version becomes available." Janet Curran, from Yucaipa, who runs an import business and owns a '99 targa and an '01 Z06, said, "I liked the lines of the C6. I loved the Daytona Sunset Orange Metallic color and would love to have that. The C6 is a beautiful Corvette, not to be confused with any other car." Jack Revel, a travel agent from Beverly Hills who owns a C1 and a C5 told us, "I was very pleasantly surprised. I did not expect it to be as beautiful as it is." Lee Anna O'Daniel, C5 owner from San Luis Obispo, said, "I'd sum up the new C6 as: Awesome, Delicious and Desirable. My how I would like to get my hands behind the wheels of that baby. The color is so Yummy!" The 2005 C6 Corvette in action. Basically, the grass roots reaction to the car was positive. I have to admit to having seen the car before, back on December 18th. Even then, with images on the Internet for months before most automotive media ever saw a C6, you'd think there'd have been little left to the imagination of those present at the car's first, for-the-record, press introduction. Nevertheless, at a TV production facility Chevrolet rented in Novi Michigan that day, when Chief Engineer, Dave Hill, took the stage; I was pumped. I was finally gonna see, up-close, the sixth-generation of America's Sports Car. 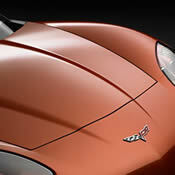 Hill talked a bit, then a car cover snapped back revealing the same orange 2005 Corvette targa the public saw, today, at the L.A. Auto Show. I was stunned. Holy crap! I thought, Is that sucker bitchin' or what? To get a better look, I stood up, ignoring most of mainstream press seated behind me who tried to remain professional as they craned their necks to see around me. Dave Hill addresses news media at the preview in Novi on 12/18/03. His key points were: 400hp, top speed of over 180 mph and 70% of the car being new parts. After Hill's presentation concluded, the media bolted out of their seats for a look at the car. Wow! In your face, fixed lights. Noticeably C2/C3-ish. Five inches shorter and an inch narrower. A little bit lighter. Seventy percent new by parts count and 85% new by weight. New base engine with fifty more horsepower. New suspension. New Goodyear tires, 18s in the front. 19s out back. Nicer interior. Cool, new electronic gadgetry. Welcome to Cee-freakin'-Six, people! For this first press preview...well, ok. It really wasn't "the first". With favoritism common in situations like this, GM's Corvette Team gave some A-list publications information about, photo sessions with and tests drives of the car back in November, but this event was the first time ordinary media like the Corvette Action Center saw C6. We could sit in the car but weren't permitted to start the engine or drive it. In fact, we weren't even allowed to photograph it. 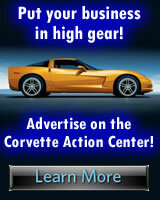 This article relies on many images supplied by Chevrolet. 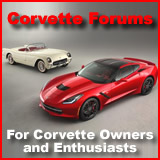 And, yeah, last month, you might have seen a few with "DigitalCorvettes.com" watermarked on them but, here at the Corvette Action Center; we don't misrepresent Chevy's images as our own. Ok, the killer questions you're waiting to ask. 1) How much? Chevrolet hasn't released MSRP and won't until close to it's on-sale date. We're going to guess it will come in at 44-45 large. 2) When? Dealers will probably place orders in a couple of months with deliveries beginning in late August. How 'bout a walk-a-round, startin' at the front with those new, fixed headlights. Oh yeah, critics whine that they're a bit Viperish but, I think the resemblance to the Dodge is obscure. I've even had readers tell me they make C6 look like a Mazda. That's a reach, ain't it? Reality is: when a designer sticks fixed, projector lights on a low, sloping front end; there aren't a lot of ways to style the light assemblies if they're to work well. The C6 front may seem vaguely like other cars but, so what? Put a sock in it, people. Our walk-a-round starts with the 2005's bold, new front end. HIDs come to the Corvette. Left to right are parking/turn signal/DRL, high beam, low beam. Each headlight assembly consists of a Xenon, high-intensity-discharge (HID), projector low-beam and a halogen, projector high-beam, plus parking, turn signal and daytime running lights. All are under a clear, polycarbonate lens. 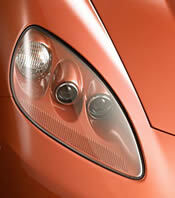 The new headlight system provides 66% more light output and a 25% wider beam pattern. High-peaked fenders and a trapezoidal-shaped hood with a noticeable "power bulge" on the hood come right out of the C2/C3 era. The '05's headlights look pretty damn cool and are a refreshing change from 42 years of hidden lights. Eliminating C5's pop-up mechanism finally gives Corvette an effective, "flash-to-pass" feature and it cleared the way for cost-effective use of HIDs. C6 now has lighting with which to go fast in the dark, a very useful improvement. The old pop-ups, while loved by designers, were about as useful as Paris Hilton at an engineering seminar. A couple of other sharp-looking, C6 exterior design features are: the pointed nose, seemingly inherited from C3, along with a traditional Chevy styling cue last used on a Corvette in 1972, an "egg crate" front grille. I sidestepped around to the 3/4 front view. For some time, scuttlebutt out of Design Staff had been that the '05 would be more influenced by Corvettes of the past, but I had no idea leveraging C2/C3 would look so good. The C6 front end kinda looks as if Chief Designer, Tom Peters, took the best C5, some C5-R and what we like about C3, mixed it well, then styled C6 from the A-pillar forward with that blend. The higher-peaked fenders, the more-trapezoidal-shaped hood and its contoured center seem right outa the '68-'82 design portfolio. Only feature which seems a little out of place are the front fender vents-a little too edgy, I think. I liked the C5s interpretation of them better.